Compare and synchronize your database data. New version (version 5) available. Read here what's new. For Oracle, MS SQL Server, MS Access, PostgreSQL, MySQL and SQLite databases. 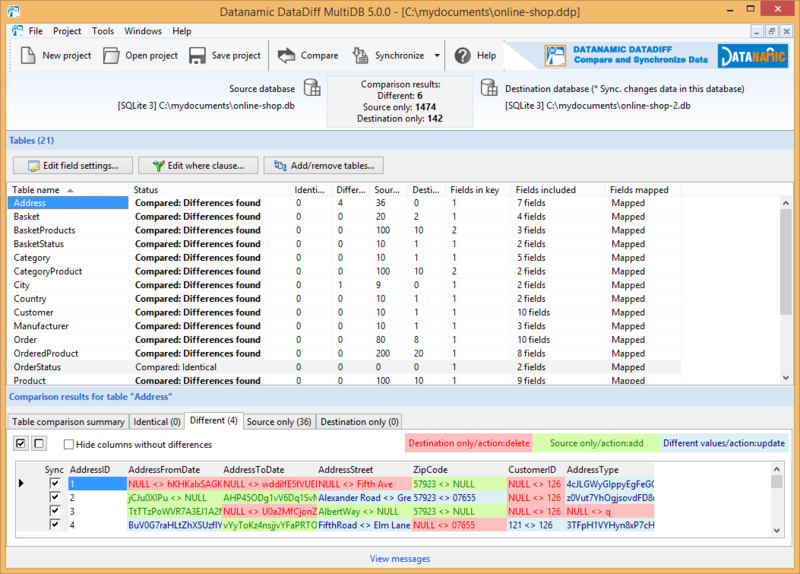 Datanamic DataDiff is a powerful and easy-to-use utility for data comparison and synchronization. Compare data for selected tables in two databases, view differences and publish changes quickly and safely. Flexible comparison and synchronization settings will enable you to set up a customized comparison key and to select tables and fields for comparison and for synchronization. 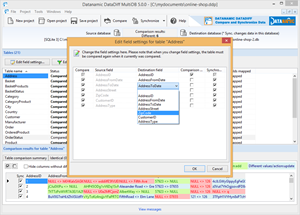 Datanamic DataDiff can be used for data migrations, verification of (corrupt) data, data auditing etc. 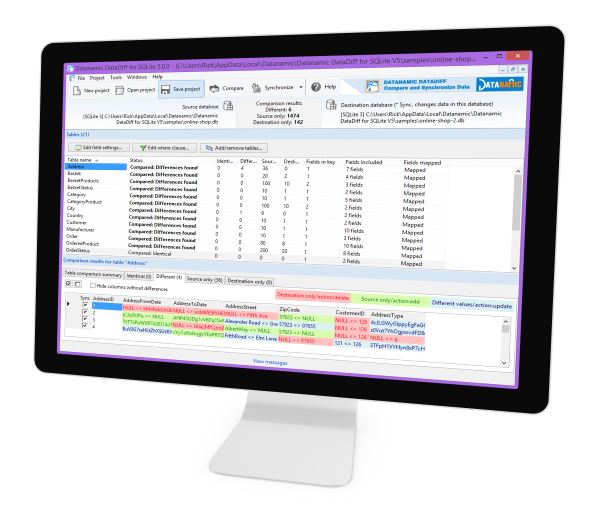 The tool uses native connections to Oracle, MS SQL Server, MySQL, MS Access, SQLite and PostgreSQL. For each supported database, database specific comparison and synchronization routines are used. 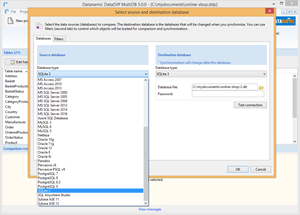 Datanamic DataDiff can be used by database administrators who work, developers, testers that need a quick, easy and reliable way to compare and synchronize database data. 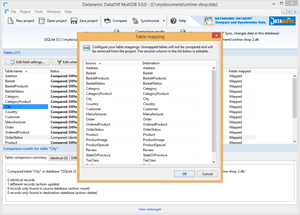 The MultiDB edition of Datanamic DataDiff is especially useful when your organization works with multiple database types/platforms. Please note that the MultiDB edition cannot compare and synchronize across different database types (e.g. Oracle and MS SQL). That functionality is available in the CrossDB edition. Compare complete databases or a selection of tables. You can define which fields to compare. Unique is that that does not mean that you cannot synchronize excluded fields. You can always synchronize a field, even if it was not included in the list of fields to compare. Cross version comparison and synchronization. Comparison and synchronization can occur between two different database versions. A comparison key is automatically selected if your tables contain a matching unique key. You can also define your own comparison key (any combination of the fields of that table). Control the way data is compared. Ignore spaces, trim strings, match NULL to empty string, case-insensitive comparison, etc. Fast comparison of large databases. 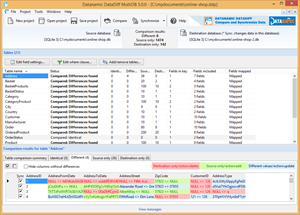 Optimized memory usage and comparison routines make Datanamic DataDiff one of the fastest products for large databases. Special routines guarentee fast comparison of binary data. The comparison results grid includes a special viewer for binary fields. Data filtering with WHERE clauses. You can define a where clause on each source and/or destination table. Compare fields with different data types. Data is automatically converted in such a way that they can be compared. Tables and columns are automatically mapped. You can manually map any table and column. Export the comparison results to CSV files. Synchronize directly on database or generate a update script. 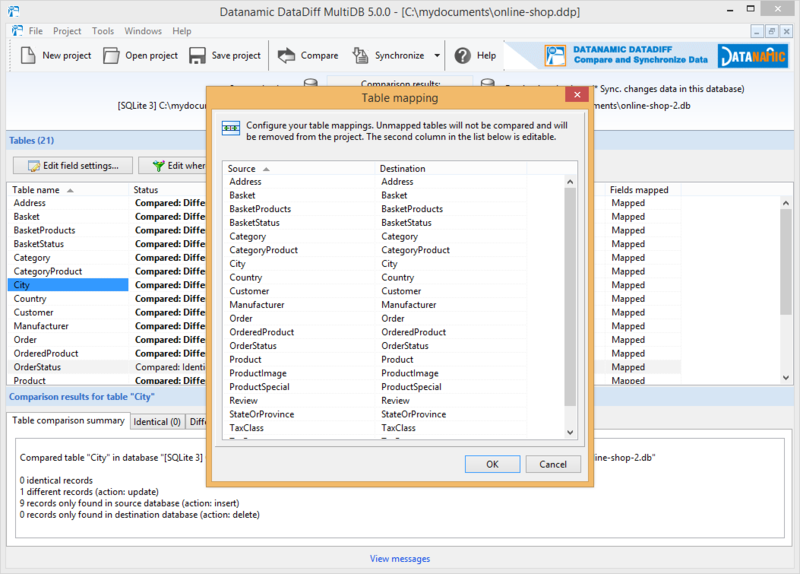 Datanamic DataDiff handles data dependencies and referential integrity during comparison and synchronization. To speed up synchronization you have got the option to disable foreign keys during synchronization. Partial synchronization allows you to synchronize only selected columns and/or only selected records. Synchronization for binary data is supported when you synchronize directly on the database. Warnings on record level for potential errors during synchronization. Warnings appear in the comparison results grid when synchronization might lead to invalid data. This is the case when the destination field for example requires a value but the value that is gonna be inserted is a NULL value. Exclude fields for synchronization on project level. In the project options dialog you can define a list of field names for fields you don't want to synchronize. This way you don't have to exclude those fields manually. This is very useful to exclude columns used for auditing purposes. Custom SQL code that will be executed before and/or after the actual synchronization process. Control the way the data is synchronized. Disable triggers, disable foreign keys, number of records per transaction, etc. Easy-to-use navigation through the color-coded data differences. A command line utility is included to automate your data compare and synchronize process. 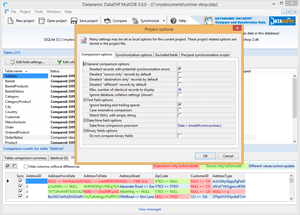 Save your data comparison plan to a DataDiff project for later re-use. You do not have to reconfigure your complete compare plan when the structure of a source or destination table has changed. Datanamic DataDiff will do that for you automatically. Oracle 9i, 10g, 11g and 12. Works without Oracle client software. MS SQL Server 2000, 2005, 2008, 2012, 2014 and 2016. 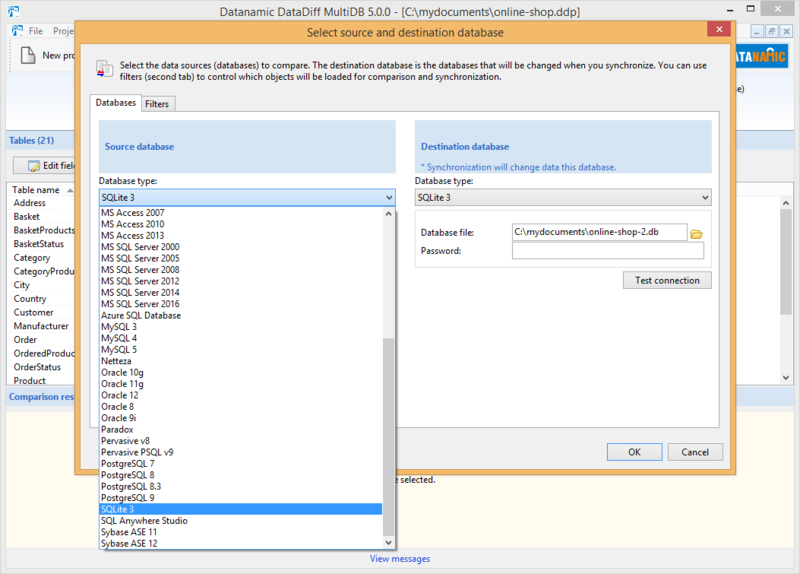 Comparison and synchronization across database versions is supported. e.g. compare a MS SQL 2016 database with a MS SQL 2012 database. Please note that cross database platform e.g compare an Oracle database with a MS SQL Server database is not supported in the edition. You will need the CrossDB edition then. Detailed overview of data differences. Control the way data is compared with the comparison options. Select the databases to compare. Edit field settings for a table: mapping, custom comparison key, etc. Oracle, MS SQL Server, MySQL, PostgreSQL, MS Access and SQLite. MS Access 2000, 2003, 2007, 2010 and 2013. Pricing for Datanamic DataDiff starts at $ 199 for a single user license (EULA). Upgrade Protection/Support is optional and costs 20% of the initial purchase price per year. Start synchronizing your database data today. If you buy our software in bundles you save a great deal of money on the price of the individual database tools.